Pricebusters Saving Your Hard Earned Money: Bacon Pancakes! I was on Pinterest the other day when I found this recipe! 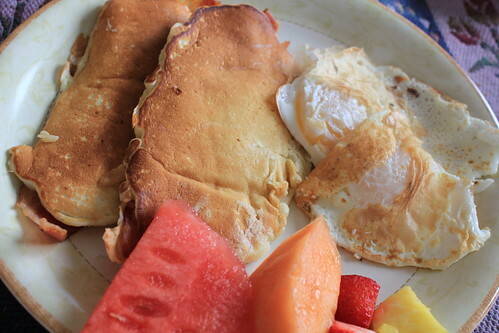 Bacon inside of pancakes, is there anything better? So, I was inspired to try them this morning! First, I did the bacon(to perfection) on my new to me George Foreman grill! Then I substituted our pancake recipe for the pancake mix in the original recipe. Mix dry together, add to wet, mix just until combined. Of course I didn't have everything! I thought the mayonnaise squeeze bottle I kept had a large pouring spout, but it didn't! I improvised and used my pouring measuring cup. They aren't perfect, but they are still tasty. 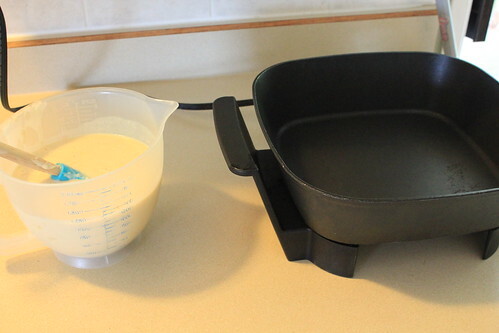 I poured a long line of batter onto a preheated(375) frying pan. then I pressed the cooked bacon piece into the batter and poured a thin line of batter over the bacon. Then I just continued to cook until done! So, yummy!